At San Giorgio, our Neapolitan pizza dough is made fresh and naturally fermented in accordance with the strict standards of the authentic Vera Pizza Napolenta. 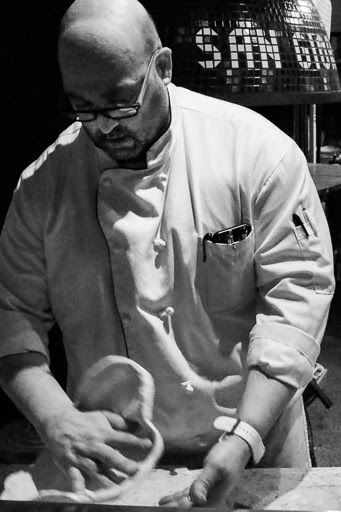 Our pizza is cooked at 900°F in a Stefano Ferrara, wood-fired oven and is finished in 70-90 seconds. This extreme heat creates a pizza with a light and fluffy “cornicione” (crown) and a soft, thin center. Saint George is one of the great martyrs of the early Church. He was a soldier and rose to high rank in the Roman Army. The [Roman] Emperor Diocletian [284-305] honored George for his great bravery. When George became a Christian, he resigned his position in the army, and rebuked the Emperor himself for being so cruel to the Christians. He was put into prison and tortured, but nothing could make him change his mind. He was beheaded about the year 303.The Christians took his body to Palestine. Pilgrimages were made later to his tomb in the Holy Land, and many miracles were worked through his prayers before God. 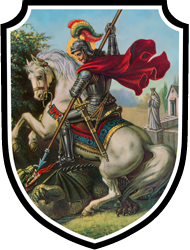 The figure of St. George and the Dragon is a symbol of his Christian courage in overcoming the spirit of evil, the devil, who in the Bible is called the dragon. St. George was chosen as patron saint of England by the first Norman kings, and in the thirteenth century his feast [April 23] was declared a public holiday. 838 N. Old World Third St.